New Wave Domesticity: DIY Plant Markers Tutorial! I have been on the hunt for the perfect adorable plant markers that I could customize, but after scouring Pinterest for weeks, I came up short. I decided to experiment a little with the left over oilcloth from the outdoor bunting I made last week and came up with these darling little flags! I absolutely love the pop of color they add to my mostly green veggie beds and they match perfectly with my colorful containers on the deck! They are also pretty easy to put together and can be customized to your hearts content! Oilcloth is the ideal medium for this because it is already waterproof, but you could also experiment with other materials like sandwiching pretty paper between the layers of vinyl and adding extra coats of outdoor modge podge to get a good seal. Another option would just be to paint directly on the oilcloth with a nice heavy duty acrylic paint, but I can't paint to save my life, hence the printer is my BFF. *This is available at your local craft store - usually in large rolls. You can also buy it online. I used a 30 gauge because it was the thickest one available at my store. 1. 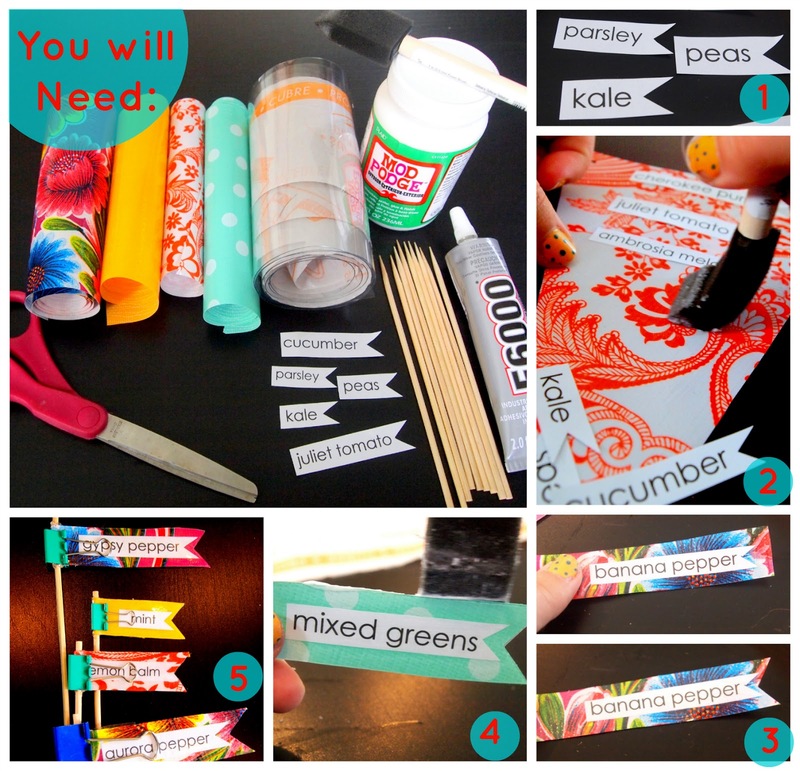 Start by creating the text for your markers. I printed a list of the things I was growing on basic white printer paper, but you could handwrite or use cute letter stamps. Cut eat one into the shape you'd like. I went with these cute little banner shapes by making a rectangle and then just cutting a little triangle off each end. Each strip is about 1/2" tall. 2. Using your mod podge, glue down the paper to the oil cloth. Make sure you have enough room (at least 1 1/2") on the left to wrap around the stick and then an extra 1/2"-1" on the right to cut you triangle for the flag. Also be sure to space them at least 1/2" or more so that you can cut the strips. Add a layer on top to get a good seal. Let this dry. 3. Cut your strips out of the oil cloth. I left about 1/4" on the top and bottom, but you can leave as much room as you like. You can also do this step with a paper cutter or a straight edge with a rotary cutter if you want to be precise, but I just did it free hand with the scissors and shaped as I went. Overlay your clear vinyl and cut it into a strip that matches shape of the oil cloth. Coat the vinyl in mod podge and lay it on top of your oil cloth. Let it dry for about 30 minutes to an hour. Don't worry about the white streaks, it will dry clear! Once the mod podge is dry (it will no longer slip around on top of the oil cloth). You can cut your triangle off the end. 4. Seal the edges with a coat of mod podge. This will ensure that water can't get in between your oil cloth and vinyl to protect the paper inside. Just use a foam brush and rub it along the edge. Since the mod podge dries clear, don't worry if it gets on the front vinyl, you can just coat the whole thing if you want. Let dry. Add one more coat around the edges. 5. The last step is attaching your sticks. To do this, just turn it over add your E6000 to the flat edge. Use the non-pointy end of your skewer to spread the glue and be sure the stick is nicely coated. Wrap around the stick. Once it's tightly wrapped and in place, use a binder clip to hold it in place. Let dry. Add to your plants and enjoy! You can also experiment with different shapes! This heart was made with the same process, I just used a large heart punch and added one more layer of the clear vinyl to the back side to make sure the stick was held tightly in place. I love this shape because I can add notes like planting dates!